Attendees at the 62nd Harker Family & Alumni Picnic on Oct. 14 gloried in the timelessness of the picnic: new things each year–especially the faces of students growing up–and some of the classics, like the never-get-tired-of-it dunk tank. 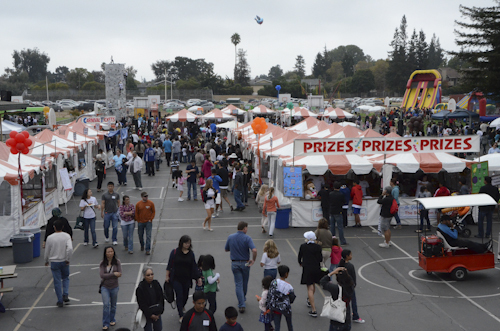 The whole event, one of the big opening events of the school year, was attended by about 800 people and again fulfilled its promise in providing fun and entertainment to the entire Harker community on a warm fall day. Families were greeted by Harker faculty and staff as they reached the entrance to the middle school campus, where the day’s festivities took place. This year’s theme, “Jaws, Paws and Claws,” celebrated all manner of wildlife, and patrons were treated to animal shows at the Blackford amphitheater throughout the day. The crowd was also entertained by an energetic show by a wide selection of groups from Harker’s performing arts department, including Dance Fusion, the grade 4-6 boys and girls dance group; Downbeat, the upper school show choir; and the grade 6 choir, Dynamics. Picknickers, particularly the younger ones, especially enjoyed being able to see and pet the pigs, goats, rabbits and other animals on display at the petting area. Talented and well-trained dogs performed tricks and ran through an obstacle course to the delight of audiences, and even a python several feet in length was available for visitors to view and briefly wear on their shoulders. The always-popular game booths were among the main attractions throughout the day. Volunteers spun wheels of fortune, players tossed golf balls, shot hoops and more to win a myriad of prizes, including stuffed animals, toys and bottles of wine. One of the most popular carnival games, the dunk tank, continued to be a hit with picnic-goers. “The dunk tank was a little cold today. If you noticed, the weather was a little overcast,” said upper school chemistry teacher Andrew Irvine, who had an early shift. He was one of a number of faculty members who had the honor of sitting in the dunk tank this year, and one of the most enthusiastic: “I kind of like the anticipation,” Irvine said. Kaela Bien, grade 5, who liked “watching the teachers get dunked,” also enjoyed the canine feats on display at the dog show. “It’s fun, and they’re sort of mischievous too,” she said. Generous student and parent volunteers helped sell tickets to the booths that kept visitors entertained and fed all day. Food booths, run by parents, faculty and staff, served delicious refreshments, snacks and hot meals from a variety of vendors. Returning were the food trucks, which proved a hit during the 2011 picnic and received a similar response this year, serving Asian fusion and other types of cuisine. “When you see everybody come together, and see all the people in their civilian clothing, it shows the magic that makes the Harker community Harker,” Irvine said.